Students from K-State's hospitality management department traveled to New York City in November to participate in the Smith Travel Research Student Marketing Competition at HX: The Hotel Experience Show, previously the International Hotel Motel and Restaurant Show. This year, the competition hosted teams from 25 schools representing leading hospitality programs across the nation. Each team created a comprehensive presentation on a focal city for the competition. Three seniors in hospitality management comprised the undergraduate team: Cody Duffey, Logan Edwards and Victor Garcia. 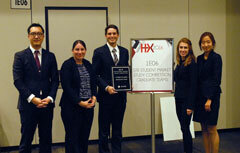 The undergraduate team focused their presentation on Denver, Colorado, and placed fourth among 18 nonfinalist teams. The graduate student team included Michelle Alcorn, Ryan Irvin, Juhyun Kang and Laura Rozell. They presented on Portland, Oregon, and placed third in the graduate competition. The undergraduate and graduate students had previously completed an applicable project in their Lodging Management Theory course, taught by assistant professor Jichul Jang, wherein they worked with Smith Travel Research data to analyze size, structure of market, hotel brands and key performance indicators such as occupancy rate percentage. With Jang's guidance, both teams feel that K-State's initial showing at the competition was successful. "Each of the students worked exceptionally hard and represented K-State in an excellent light," Jang said.